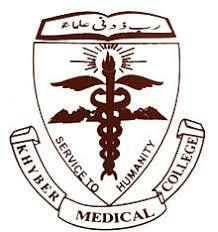 Peshawar, Khyber Medical University Peshawar has announced the admission process in the KMU Certificate in Health Professions Educations (CHPE). The candidates will check their eligibility criteria and they will send their application forms for grant of admission in KMU CHPE. Last date for the submission of the admission forms in 24-10-2018 and the candidates will be shortlisted and their interviews will be conducted on 29-10-2018. 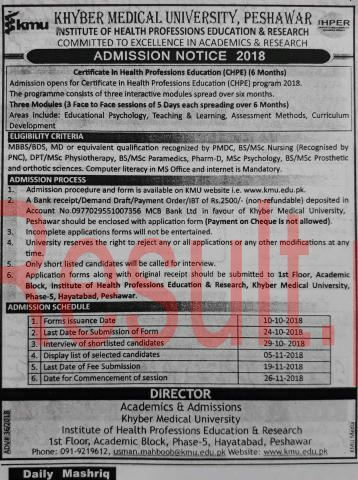 KMU will display the merit list of the candidates on 05-11-2018 and the candidates will deposit their admission fee till the final date of 19-11-2018. The new classes will be commenced from 26-11-2018.